Toyota revealed the Concept-i at CES on Wednesday, a new concept vehicle that the company built with its Newport Beach CALTY design research group, with tech supplied by the carmaker’s SF-based innovation hub. I spoke to CALTY Project Design Manager William Chergosky about the process of creating Concept-i, which he said was about finding a way to bring the excitement people feel about driving now to a potential future in which autonomous driving is much more prevalent. A big part of achieving that comes down to user experience design, according to Chergosky, which is why the Concept-i pays close attention to how the car greets the user, and how it signals a shift from manual to autonomous driving mode. LED lights across the body and throughout the interior cue the driver about their driving experience, setting the tone for either method of control. To do this, they took the idea of “kinetic warmth” as a core guiding principle in designing the Concept-i, which meant establishing something that felt at once alive and technically capable. That’s why Toyota placed an AI at the center of the in-car experience, which it dubbed ‘Yui’ (you-EE). This virtual companion is designed to get to know you as a driver and as a person, and to adapt its behavior in order to best provide that “waku-doki” that Toyota aims for – that spirit of driving excitement. An AI provides some unique advantages in terms of achieving this; it can actually learn what that kind of experience means for you as an individual driver, instead of relying on some generalized concept. And as mentioned, CALTY was also hoping to disintermediate the experience of using a car with autonomous tech on board by giving the vehicle a real personality, expressed by Yui via dashboard, interior and exterior light, sound, even haptic feedback. Yui also addresses a key area of focus for autonomous driving and making it viable on real roads: Communicating with pedestrians and other vehicles. 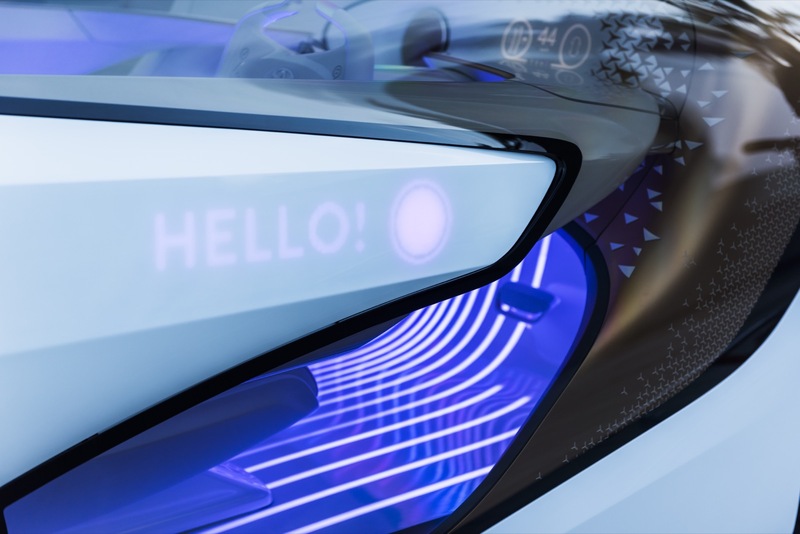 Through Concept-i’s exterior lighting system, Yui can tell others whether it’s in manual or autonomous drive mode, greet drivers or passengers approaching the car and notify drivers behind about upcoming road hazards or turns. Concept-i and Yui are both very much still concepts, which means what eventually makes it to production from Toyota in a self-driving future could look very different. But it’s an interesting exploration of some of the remaining challenges we face as drivers staring down the onrush of autonomous vehicles.